Brody is done. This was a fun painting to do. 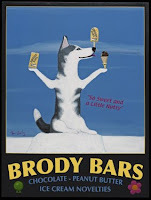 Brody has his ice cream novelties (I've always love the term ice cream novelties). 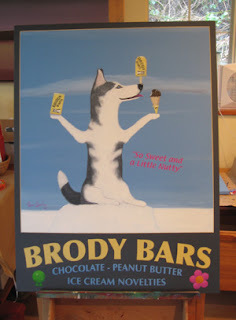 The tag line next to Brody reads "So Sweet and a Little Nutty". The little green ball with feet and the flower on the right are Brody's favorite toys. Today I took the painting to the photographer, Ken Wagner, in Seattle and I'll pick up this Brody painting in a few days and ship him to Chicago where Brody lives. Ken Wagner will take a 4 x 5 transparency and then scan the transparency. I'll get a disk in addition to the transparency. When I get disk with the image, I'll post a better image. After I get the scan, I'll then alter the image to make an image for limited edition prints and products. It will then be Husky Bars. I'll then post the print image. Commissions can be directed to a specific dog or cat, like Brody Bars or it can be a generic commission for a breed. A couple of years ago, I painted Akita Green Tea for a tea shop in Kyoto, Japan. This wasn't a specific Akita it was a compilation of a couple of Akitas. Ken Wagner does the photography for many artists, artisans and galleries in Seattle. He has a studio that is always set up and ready to go. He works fast and his pricing is quite reasonable. He better never retire.